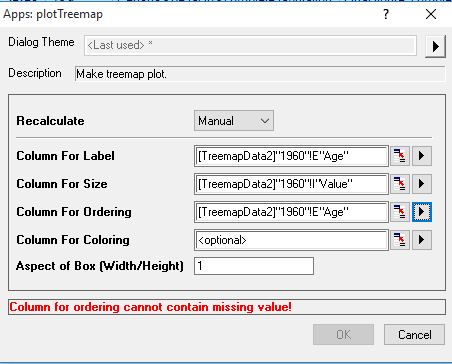 Treemapping is especially useful for displaying proportional data across different groups/categories, and is often used in the fields of sociology and popular economics to illustrate demographics, preferences, and other metrics. With the release of Origin’s new Treemap Plot app you can now generate these infographics in Origin or OriginPro. You can view the end result of this post in Origin using this OPJ. Here we have some modified UN data for Brazil’s age demographics in 1960 and 2010. 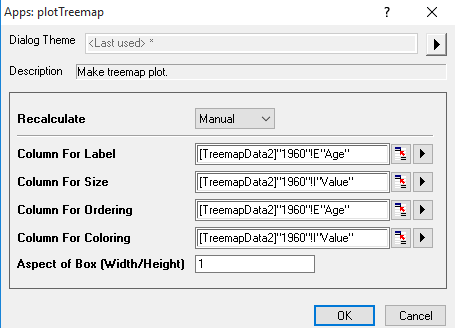 If we want to generate a treemap illustrating the proportions of each age group out of the whole population- with this sheet open, click on the Treemap Plot app in the Apps Gallery. In the resulting dialog, we’ll set the Age column as the “Column for Label“, the Value column as the “Column for Size“, and the Age column for “Column for Ordering“. As you can see the Column for Ordering entry generates an error message for “missing” values. This is because our the age groups represent discrete categorical data while the program handles them as continuous numeric data. To change this, click cancel and go back to the worksheet. 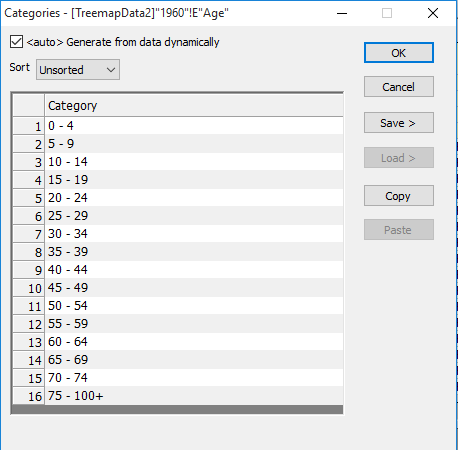 Select the “Age” column, right click it and select “Set as Categorical” so each row is handled as a label rather than a mathematical expression. Upon doing this, a category row will appear with the word “Unsorted” above the Age column. To see the order that this column’s entries will be processed, double click on that cell to open the category dialog. The order of these categories can be viewed and rearranged in this window, however in this case we have no reason to alter the categories as they are already listed. Closing out of the category dialog, go back to the Treemap app and select the columns given in the above screenshot. 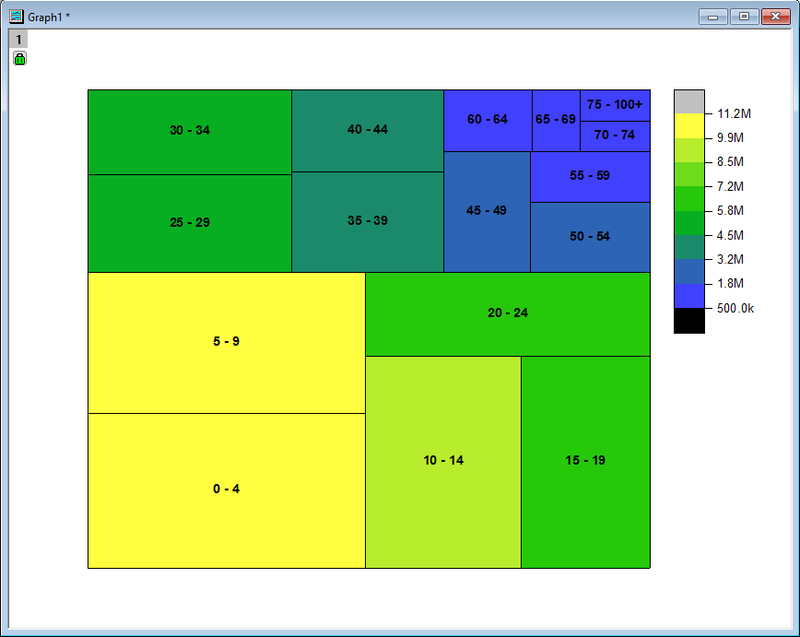 After clicking okay, you should be able to see a treemap plot similar to the one shown here. Colors for these graphics can be changed readily using the palette button, and the legend can be set to engineering notation by double clicking on the legend, unchecking “auto” in the labels tab and changing the display option. After generating a second treemap for our 2010 data, we can immediately notice the difference in the younger population between 1960 and 2010. Even though the overall number of people aged 0-9 increased (as one can see by the numbers in the legend), they represent a smaller proportion of the overall population in 2010- signifying an aging population. This is just one example of how treemaps can be used to illustrate statistics for variety of audiences.